After what seemed like an endless chain of reviews going over each and every toner I own—from the wiping-off-the-remnant-of-your-cleanser to the serious heavy-duty exfoliating toners, I want to put the spotlight on a recent favourite category within the toner family—the spray type hydrating ones. Hydration is what keeps our skin soft, supple, elastic and young. Even if you have oily skin like I do, you need to keep it hydrated to avoid dehydration (duh! ), a major cause of skin aging and other issues like acne. And I can say this without batting an eyelid that my skin has never looked this young, primarily because I keep it hydrated. Hydration is also essential if you are using facial oils or facial balms in your skincare routine. Ever since I started incorporating specific oils and balms in my routine, hydrating toners have become a necessity. This is because oils do not readily get absorbed into the skin; they need a carrier to get absorbed completely. This carrier is water or other humectants like aloe vera. For more information on moisture and humectants, check out this blog post that I wrote last year. The idea therefore is to spray a hydrating toner on clean damp skin or pat in an essence-like product (more common among Korean beauty fans) and then use a couple of drops of facial oil or a smidgen of a facial balm and massage it in. If you do this, there is no need for lotions and creams, which contain emulsifiers (emulsifiers are agents that mix oil and water in a product) and preservatives (necessary to prevent microbial growth since the product contains water). Since facial oils and balms typically don't contain any water, they don't require emulsifiers or preservatives and can give you potent, concentrated ingredients and the highest skincare benefit. This is also a reason why facial oils/balms are more expensive than lotions/creams as they don't contain fillers like emulsifiers and preservatives, which are inexpensive. Sorry for that segue into why facial oils/balms are important—I might do a separate blog post on them. But moving on, I own several hydrating toners, and after a lot of trial and error, I'm ready to share my concrete thoughts on them. Needless to say, some of these are now my holy grail toners while a few were highly disappointing. If you have specific questions about any of these, please comment below the post and I'll be happy to answer them. A holy-grail toner for me, this 40 ml modestly packaged bottle may not impress you at first but it's chock-full of the most concentrated and all-organic ingredients. It contains essential oils of Jasmine and Wild Jasmine blended with the extract of distilled Jasmine petals, demineralised water, BON's pure aloe vera gel, essential oil of vanilla (which usually gives me a headache but it's used moderately here), sweet almond oil and vitamin E. The 40 ml size is perfect for taking along on travels or even in your daily handbag. I reach for this toner frequently for a mid-day boost to my skin and also to uplift my mood and shake off lethargy. Most of all, it's the most affordable toner I own. What more can you ask for? Get it stat! Another favourite of mine, this toner is equally good for spraying on a cotton pad and swiping over the face post cleansing as well as spritzing directly on the face. When used on a cotton pad, you'd be shocked to see how much dirt is left behind by cleansers. On a side note, almost all cleansers, no matter how highly raved or conceptually sound, leave behind smidgen of dirt, so this step is essential. This toner contains some of the best ingredients one can hope for: steam distilled orange blossom water (40%), steam distilled tulsi water (30%) -- that's 70% of two great ingredients, in addition to pomegranate extract, mandarin orange essential oil, bitter orange peel extract, aloe leaf juice, Indian senna (a botanical alternative to synthetically-made hyaluronic acid), and more. What I appreciate the most about this toner is its scent of bitter orange, which offsets the sweet scent of pomegranate. Contrary to my thoughts shared above, this toner from the same brand was a disappointment. It smells nothing like a rose. Now I'm not expecting it to smell like a bouquet of roses but this one smells downright like rice water. I'm not kidding! Another utter disappointment was this Mogra Water from Kama Ayurveda, which smells like the weakest mogra ever. Halfway through the bottle, there was no scent remaining. It appeared as if I was spraying plain water on my face. My search for a true rosewater toner led me to this one by Soultree. Again, not sure what's happening here but this toner smells spicy. How is that even possible? The inci list shows some great ingredients such as Rosa damascena (rose) water, Hamamelis virginiana (witch hazel) water, Glycerine, Aloe vera juice and more, but the formulation falls short in performance. I can hardly notice the toner doing anything for my skin, which proves that ingredients are not everything. Even if you source the highest quality ingredients, your formulation still needs to be effective to produce a positive and appealing result. Now, I mainly use this sprayed on a cotton pad to take away any leftover residue after cleansing. With that said, I think my search for that perfect rose toner has come to an end. 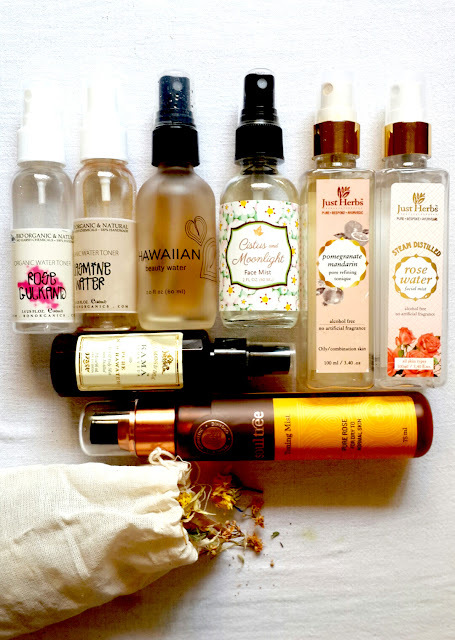 With two recent disappointments (Soultree and Just Herbs rose water toners), I had almost given up on Indian brands. Then, a comment on my Instagram by Nishantaini, the lovely owner of Auroville-based Bon Organics, gave me hope. When I expressed my disappointment with these toners, she asked me whether I have tried the rose water from her line. Her quiet confidence (in her product) was so refreshing, a far cry from most brands that don't bother to connect with customers or really care about meeting their needs. So, during a recent sale event on her webshop, I added the Rose Gulkand toner to my cart, along with a second bottle of the Jasmine Water. You guys know I love that one! When I finally had the rose toner in my hand, I uncapped the bottle and braced myself for the scent to hit me. After spicy and ricy, I did not know what to expect. But you guys...this is it! This is what I wanted. The product name is spot on. If you've ever had 'gulkand', you know what it smells like, a potent earthy rose that is sweet and cooling. This toner is that and more. It not only contains the most genuine and pleasing rose, it also shares many of its ingredients with the Jasmine Water. BON's pure aloe vera gel, demineralised water, essential oil of vanilla, sweet almond oil, and vitamin E in addition to distilled rose petals. I highly recommend you try this out if you are a fan of rose water toners. This is technically not a toner. It's a mix of very specifically selected dried herbs, flowers and leaves which together when steamed help with infusing moisture into the skin while also soothing, nurturing, and repairing the skin tissue. Where the toner part comes in, is the leftover brew that I strain and bottle to be used as a spritz toner. The brew is as moisturising as the steam and is undoubtedly the most hydrating toner I own. Ava, the founder of Earthwise Beauty, is known for her flawless product formulations and deep knowledge about plants, flowers and herbs so I'm not surprised that she created such a potent product. I see this as a staple in my skincare routine. Another gem from Earthwise Beauty, this mist has met with mixed reviews and I can understand why. Where majority of skincare users love scents of rose and jasmine in their toners, this one stumps you with its full-blown honey scent. When I smell this, I get a rich sweet honey scent with something at the back almost like a sharp green note. I cannot describe it clearly. Honey reminds me of medicines -- when I was a child, my folks used to mix honey with crushed pills/tablets to help me swallow the otherwise bitter mixture comfortably. Not a pleasant memory! Anyway, even after knowing about the toner's honey scent, I bought it for two specific reasons. One, the cistus flower, whose hydrosol makes up the majority of this toner is known to reduce signs of aging and is pore minimising, naturally antibacterial (also anti-viral and anti-fungal), anti-acne, and nurturing. I badly needed a toner with pore minimising and antibacterial properties, yet be non-drying and hydrating. If you look around the skincare market, you'd find toners aimed at acne-prone skin to be drying. Why?! Anyway, reason number two for getting this was the addition of flower and gem essences which turns this toner into an aura mist. Aura mists are an instant aromatherapy treatment that help shift your energy and mood. I highly recommend you read more about this on the Earthwise Beauty website because no matter how well I explain, it would be insufficient and better left to experts like Ava. Now coming to my own experience, despite the honey scent, I find myself drawn to this toner. I keep spritzing it several times a day and also over my head as suggested by Ava in order to benefit from it as an aura mist. It's too early to speak of its aura-repairing properties but I will report back soon. As a skin toner, it checks all the boxes. My skin is left hydrated and soothed. I have also observed subtle pore minimising effects. This toner while fashioned to be a spritz toner is actually meant to be sprayed on a cotton pad and used as an exfoliant. The blend of hibiscus, coconut water, Hawaiian sugar, rose, witch hazel, willow bark and papaya enzymes exfoliates the skin in the most subtle and natural way. A great concept but my skin is akin to rhino skin. For some reason, I don't see much, if any, exfoliating effect. Another reason could be that I'm used to stronger exfoliants like glycolic acid and salicylic acid so natural exfoliants perhaps fall short. This isn't a negative comment for the toner itself. It's just that my needs are perhaps different from the others. Having said that, I have found a great way to use this to get some noticeable effect. I spritz this 4-5 times, letting each layer dry up before spritzing again. This gives me smooth and what I assume is exfoliated skin. I got this toner as part of the Art of Organics 'Fresh' beauty box back in July 2017 so it was a bargain considering the value for money part. Honey Water Clarifying Toner from RetailPharma and Brings skin into perfect pH balance.